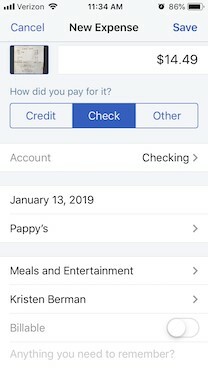 How Does QuickBooks Online Handle Mobile Expenses? - Article | Candace Ebert & Co.
QuickBooks Online will open the New Expense screen. You'll see a miniature version of your receipt in the upper left corner. Looking at your original version—it will be too small to see here—fill in the blanks with the data from the purchase. Be sure to click the Billable button if you can bill someone else for it. Make any notes you'll need in order to remind yourself of the transaction, and Add a Split if you need to divide the transaction between categories, customers or vendors, or billable status. Click Save when you're done.